So You’ve Broken Up With Lululemon—Now What? * In my first Elephant Journal article, The Day I Broke Up With Lululemon I explored my awakening as to Lululemon’s true colors and how I said good bye to Lulu for good and found some great ethical and sustainable options. Many people have asked me for a list of sustainable Made in Canada and Made in the USA options for yoga clothing. When I went hunting on the internet I found lots of options for Made in Canada and the Made in USA Yoga Lines. I’m only going to highlight the sustainable and eco options because I’m equal parts tree hugger and punk rock. Before I get into the clothing lines themselves allow me to explain why it’s important to be mindful about our Yoga clothes. I’m about to get a little “soap boxy” here but bear with me as it’s all for the greater good. We vote with our dollars every day! Yup, it’s true. Every time we spend money we are saying “I support this” or “I value this”. As individuals our small investments can make a difference. It’s called supply and demand. Corporations produce what sells and stop producing what doesn’t, it’s that simple. Buy cheap sh*t Made in China and they’ll make more of it. If we buy locally made, sweatshop-free and sustainable then we’ll have more of that in the world. As Yogi’s I hope we’re practicing Ahimsa. This non-harming includes us, our fellow humans and the earth. So, if we are buying Yoga clothing made abroad in a sweat shop, then we’re not practicing Ahimsa or seeing the big interconnected picture. To buy in-line with our values we need to consider those making our clothes and the damage to the earth that our spending habits cause. When we buy local we are reducing harmful emissions caused by transport and supporting an entrepreneur or a Mom and Pop shop to support themselves and their families. Buying local also helps our local economy (and rumor has it the economy isn’t doing so well). The clothes feel better! If you haven’t experienced organic cotton or bamboo on your body for yoga you are seriously missing out! Okay, so if you’re thinking right now, “Argh, it’s too much work, being socially responsible is exhausting, I don’t have the time” I hear that believe me! I have spent hours online (this is how Yoga Geeks spend their Saturday nights) researching this and I’m happy to hook you up with recommendations. Love Light Yoga—designed and made in Vancouver. Salts Organic-—made on Salts Spring Island, BC. Although not completely a “Yoga Line” the leggings and hoodies rock. 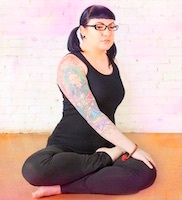 Squeezed Yoga Clothing —Yoga clothing made in Ontario. Yogo-—made and designed in Canada by Jo-Ann Oosterman. Zen Nomad—yoga apparel designed by Sonja den Elzen. Seed Yoga—let’s hear it for the boys, eco men’s yoga line. Bhakti Ware—made out of organic and sustainable fabrics. Made in the USA. Inner Waves—organic and made in the USA. Float Designs—eco-conscious Yoga apparel made in the USA. 4-th—sustainable Yoga clothing made in the USA. LVR Fashion—Organic and made in USA. 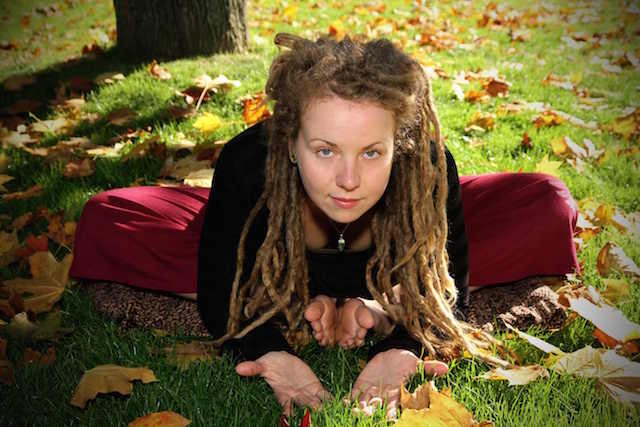 Anjali Clothing—sustainable Yoga clothing made in the USA. Sweet skins—Organic and made in USA. There are lots of Ethical and Sustainable Yoga Threads made right in our back yard. So what do you say Yogi’s—are you ready to break up with Lulu? Wanna vote with your dollar for a greener world and have some kick a** threads? If you’re with me say, “I” in the comments below and let the locally made revolution begin! We love this! All of our yoga apparel is made with 100% sustainable materials. Think recycled plastic bottles and huge fishing nets that were recovered from the ocean. All of our products are produced in with love in California. We are Mona! Yoga Smoga is manufactured in Worcester, Ma, too! I really love Nomads hempwear (some yoga clothing and also streetwear) https://nomadshempwear.com/ based in BC. From their website: "Along with a devotion for eco-textiles and an environmentally sustainable lifestyle, we also take pride in employing fair labor in the construction of all our garments. While we do manufacture in China, we spent the time and energy to source out the most environmentally friendly, fair-trade factory we could find, so that we were sure we were passing guilt-free, planet-friendly savings on to you."